For me this has never been about walking 2,190 miles. 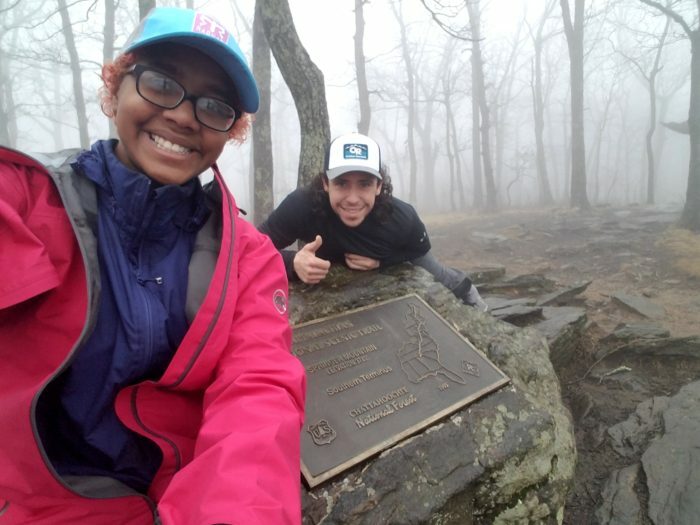 Walking the Appalachian Trail has always been about just that, walking the AT, however fast or slow I needed to go, and with small mileage goals that would equal the whole thing. And ladies and gentlemen, I have reached my first big mileage goal. I have made it to mile 274.5, Hot Springs, N.C. Allow me to take you back through time, while I relive the trials, successes, and lessons that got me here. Georgia definitely held the most lessons by far. But let’s start at the beginning. The very first day was wet, gloomy, and hard. That morning I had already mailed back a few things and the way my back felt I knew I would be sending more, very soon. Each day we got up, had breakfast, and I rearranged my pack. I had several items tied to the outside of my pack and every pocket stuffed as much as possible. Each new arrangement felt better but I knew I would need a shakedown ASAP. My first baby mileage goal was thus determined to be Neel Gap, mile 31.1. Fresh Grounds had told me about a woman by the name of Rainbow Braid who worked at Mountain Crossings. We got to Neel Gap on day four of our hike. My pack weighed 44 pounds. I sent home a box with nine pounds of things I have not missed a single day since I sent them back. I barely even remember what all was in that box. If it wasn’t for the picture, I doubt I would remember at all. 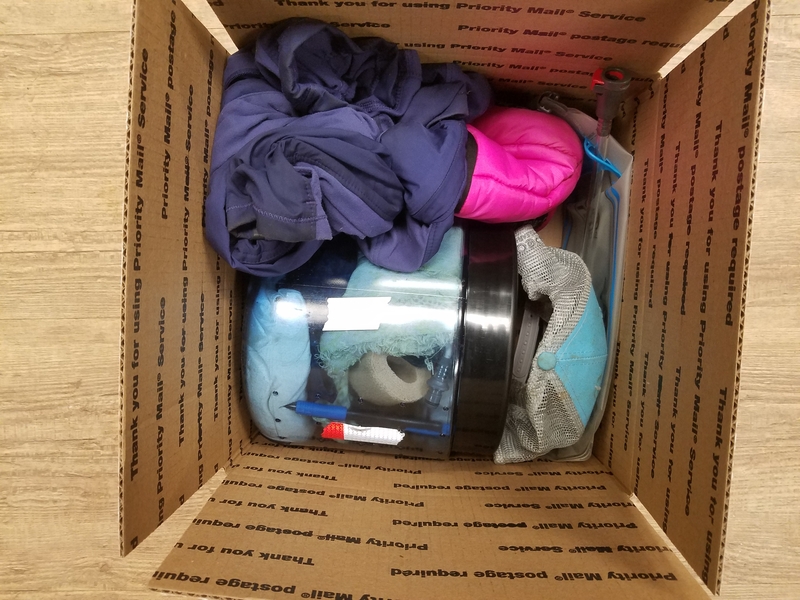 It looks like there was: a bear canister, two scarfs, silk leggings, down booties, a jacket, a cap, a water bladder, and whatever else is in there. 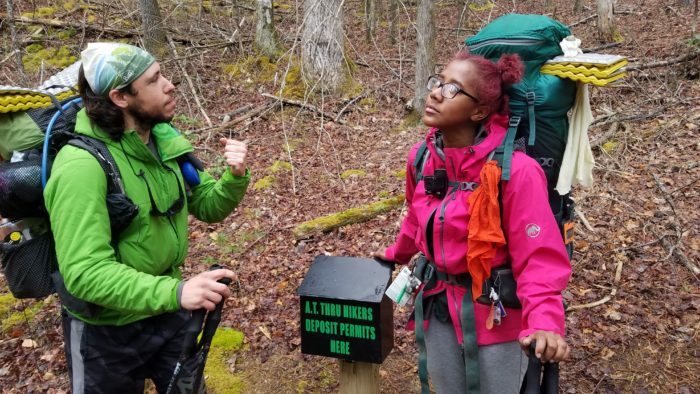 With the guidance of Rainbow Braid, I was able to get my pack down to 35 pounds with food and water. A note on the bear canister: I had always planned on sending it back but I had thought it would be after the Smoky Mountains. The only place on the Appalachian Trail where a bear canister is required is the small stretch between Jarrard Gap and Neel Gap. And that’s only if you plan on camping somewhere between there for the night. Great Smoky Mountains National Park does not require a canister; in fact, the food protocol in the Smoky Mountains is to hang it on the bear cables that they have provided at every shelter. While I was still at home preparing for this crazy endeavor, I had booked a room at the Top of Georgia Hostel, in advance (cue the scary organ music, dum dum dum). I had made my trail plan and had been very confident that I would stick to it. Even as I write this, I shake my head. Oh, to be so young and so naive again. I’m a full trail month wiser and hindsight makes me smile at my callow self. Needless to say, we were behind schedule. On the day we were supposed to be at Unicoi Gap we were 15.2 miles away at Tesnatee Gap. We pushed through and got there but it was both a hard physical day and a hard emotional day for Stickers and me. Not only did we have to do 15.2 miles when the longest we had done was 10.9 miles, we had to do it by 5 p.m. I do not remember much of that hike. My head was down and my poles were reaching and that’s all I could concentrate on. It was emotionally very difficult because Stickers and I deal with stress very differently. Where he deals with it externally and outwardly expressing his negativity, I deal with stress internally and try to make it as positive or at least as neutral as possible. But we did it and got rewarded with a hot shower and warm bed. North Carolina treated me pretty good compared to Georgia. I had a new mind-set, which helped a lot. I decided to stop fretting about mileage in any way and take it just a couple days at a time. In my preparation for this trip, I had myself resupplying once a week. However, after talking to some people at TOG I realized I needed to be spacing that out to every four to six days. For one, the weight, and for two the stress of thinking that far ahead. 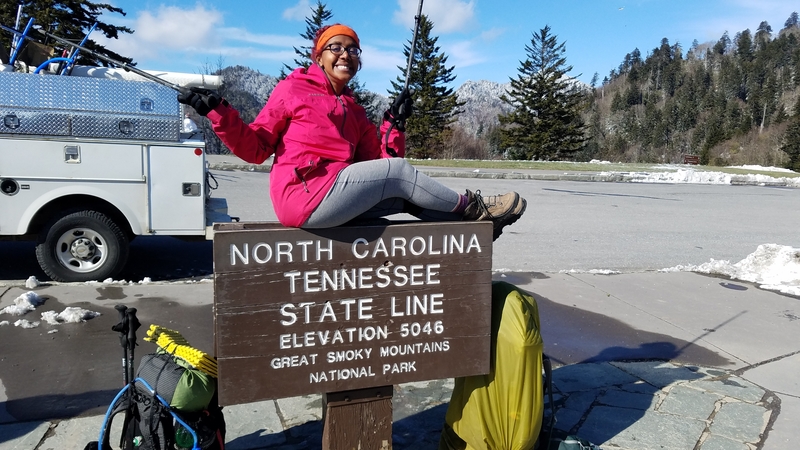 We bumped ourselves a box from Hiawassee, Ga., to Franklin, N.C., and set out with a four-day plan. It really is a small world after all. I first met Geo and Summit at the trailhead at Dicks Creek. It was early so we exchanged a few words but not much. I would see them again that night at Muskrat Creek Shelter but we wouldn’t really get to talking until the next day at Standing Indian Shelter. It was there as we were having lunch that it was revealed that both Summit and I had graduated from Kennesaw State with philosophy degrees. She graduated in 2013 and was in fact the first woman to graduate from the program. Also, we were both presidents of the Philosophy Student Association. There were four years between our graduations and we both ended up on the trail at the same time. I thought it was freaking awesome. The first really social night we had on the trail was the day before we got to Franklin. We stayed at Long Branch Shelter the day before getting to Franklin and that’s where I first met Dirty R and Grape Stomper. It’s also where I more fully acquainted myself with Nor’easta and Technomadic. Technomadic was going by Thor at the time. I had seen both of them earlier on the trail but had not conversed with them much. Nor’easta had packed in a 12-pack and a small bottle of Crown. We all drank and talked into the night. Finally, I meet Bunny Tracks and Easily Forgotten the day we went into Franklin. 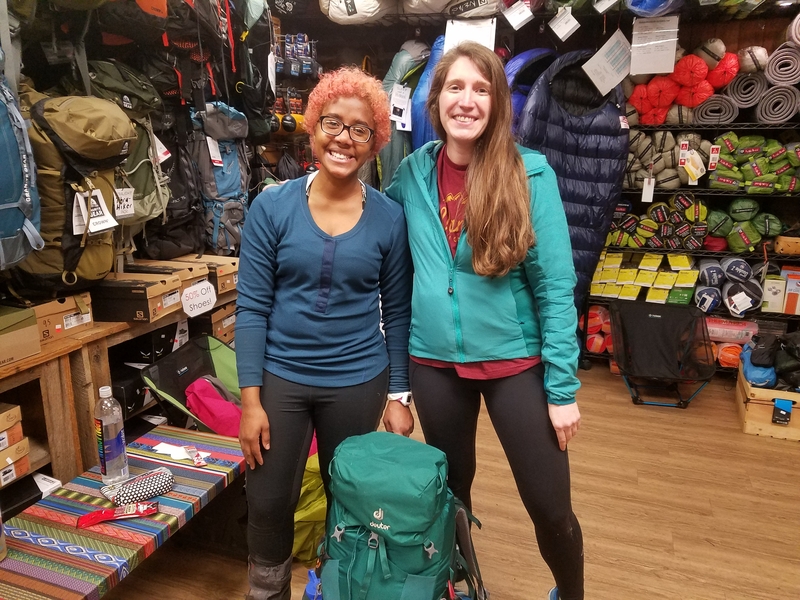 They were at Winding Stair Gap getting some trail magic from Fresh Grounds. They were there with Patches, who again I had seen earlier on the trail but not talked to much. I didn’t talk to any of them that much then either. However, I met up with them again a few days later at the NOC and we all had lunch together for a good while. These three were especially important because they were who Stickers and I got through the Smokies with. The first day into the Smokies was one of the nicest on the trail to that point. It was sunny with just a little bit of wind. Stickers and I had already decided that we would take the full eights days to go through the park. 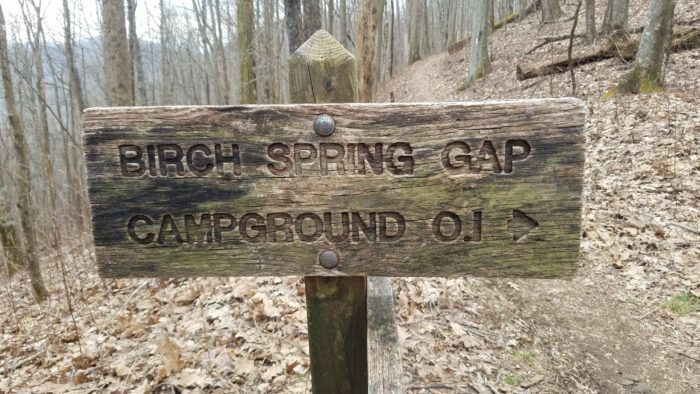 Our first night was at the very first campsite at Birch Spring Gap. There we met up with Patches and another friend named Fin. The second day in the Smokies started off cold and cloudy. But by lunch the sun was out and it was simply beautiful. 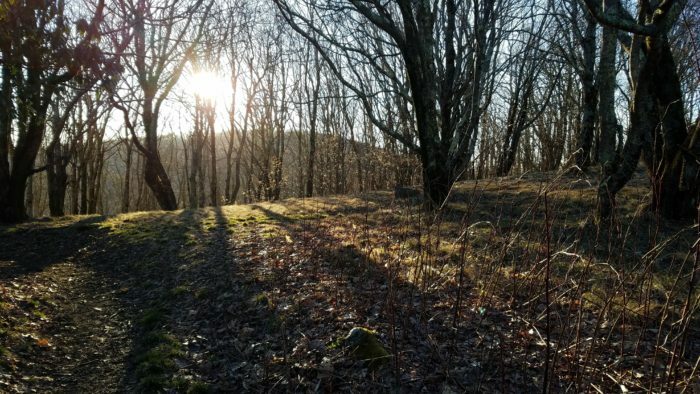 We walked 11.4 miles to Spencer Field Shelter and it was some of the best hiking we had done. We stayed there that night with Time Out, Sandles, Patches, Fin, and a weekend hiker. I can’t remember her name but she was a teacher from up north. We woke up the next morning and everything was covered in snow. We had been told to expect a light dusting but this was way more than a dusting. Time Out left first and broke trail for us. Stickers and I were the second to last to leave. Stickers, Patches, Fin, and I only made it 6.1 miles to the next shelter, Derrick Knob. It was here that we were reunited with our friends Bunny Tracks and Easily Forgotten. They had pushed on after the NOC to meet up with friends. These friends, Dancing with Dogs and Trail Runner, were at the shelter with them. They had gotten there the night before and decided to zero at the shelter when they woke up to the snow. The next day we all hiked out and made it the 7.4 miles to Double Springs Shelter. Once everyone arrived, we tried to figure out our next moves. Dancing with Dogs had thought she heard someone say that the Clingmans Dome road was open. If that was the case then we would just need to hike three more miles and find a shuttle willing to come get us. Stickers was the only one getting service. First he called the backcountry office. We needed to make sure the road would be open. It was not. 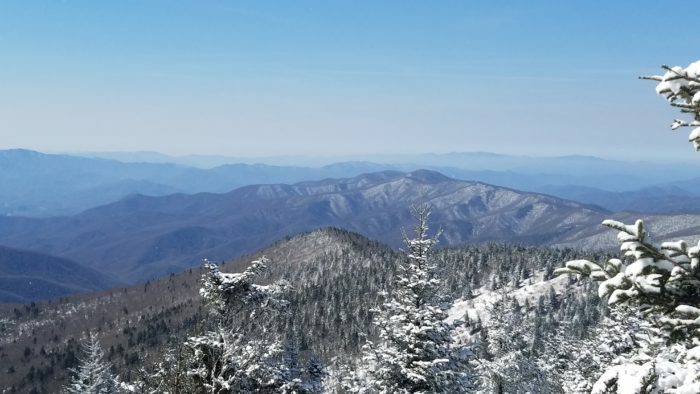 The ranger told us that Clingmans did not open till April. We were very sad. She told us that Newfound Gap road would be our best option. She said it was currently closed but might open in the morning. It was not the most encouraging news. 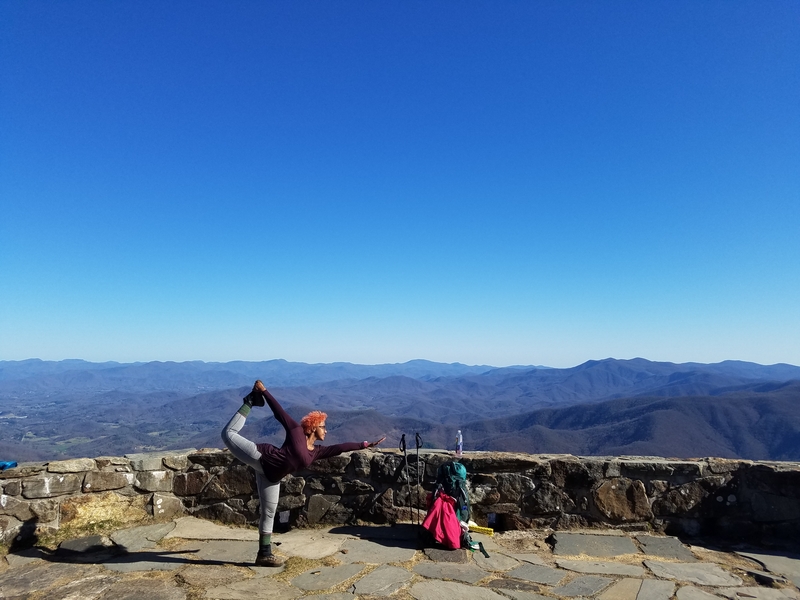 We were too tired to go on that day and decided that we would stay at Double Springs that night and push on to Newfound Gap in the morning. We woke up the next morning to clear skies and sun. 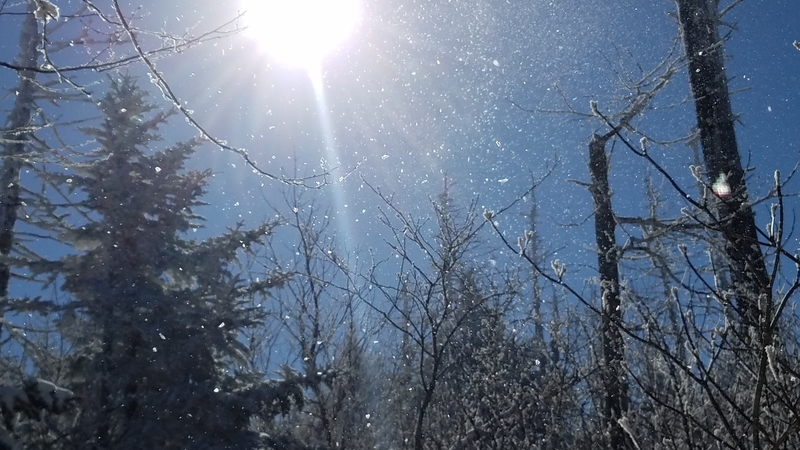 The snow looked so beautiful in the sunlight. I made Stickers put on sunscreen and sunglasses and we were off. We saw some of the most breathtaking views and they made up for everything else. We made the 10.5 miles to Newfound Gap and were able to get a shuttle into Gatlinburg. We were happy to have hot showers and warm beds. Gatlinburg held us prisoner for five nights and five days. I was never so happy to return to the trail as I was after Gatlinburg. We only did 3.1 miles the first day back in the Smokies. It was still very cold up there but I was glad to be back on the trail. It took us four more days to get through the Smoky Mountains after we got back on trail. We didn’t walk on snowless ground until the fourth day. Stickers and I stayed true to our word and only took eight days in the Smoky Mountains and were so happy to have them behind us. We found ourselves at Standing Bear Farm on St. Patrick’s Day and it was decided 3.6 miles was plenty that day. We celebrated finishing the Smoky Mountains and this great holiday around great friends and that magical liquid, beer. It took a lot for me to will myself to leave Standing Bear Farm. The massages we planned to get in Hot Springs were the only things compelling enough to get me to push on. Walking out of Standing Bear was rough for other reasons as well. Namely, the horrible headache that persisted all day. But I got the 6.9 miles to the shelter. We had snow free-hiking and great views the next few days. 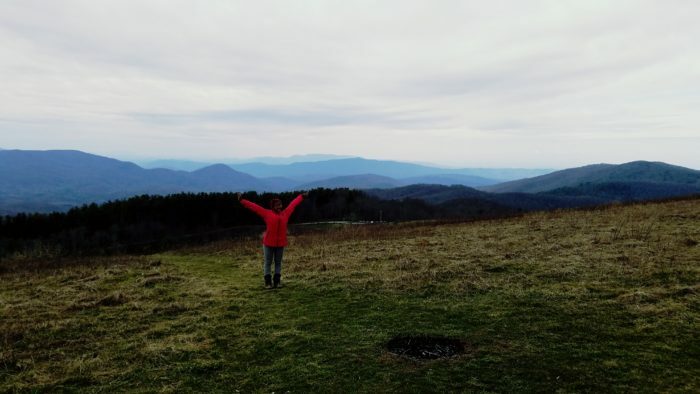 Max Patch was pretty awesome and I got to see a bit of a sunrise on day four. We had planned to only hike 9.9 miles to the shelter right before Hot Springs and nero in the next day. However, we got to the shelter at around 2 p.m. and we were hearing that bad weather was coming in that night. 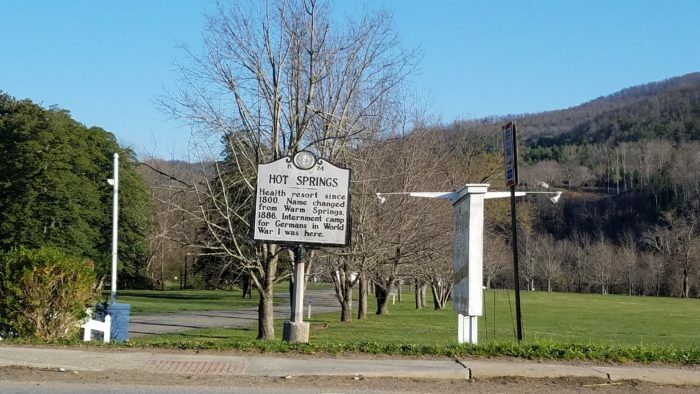 So we pushed on and knocked out the 3.2 miles into Hot Springs. I absolutely loved Hot Springs. Everyone was so nice, from the people running the hostel to the ones serving us in town. Stickers and I never got our massages but we did go to the hot tubs. We went with Patches, BT, EFG, and our newest friend, Postcard. It was pretty awesome because it was snowing outside but we were warm and relaxed, enjoying life. 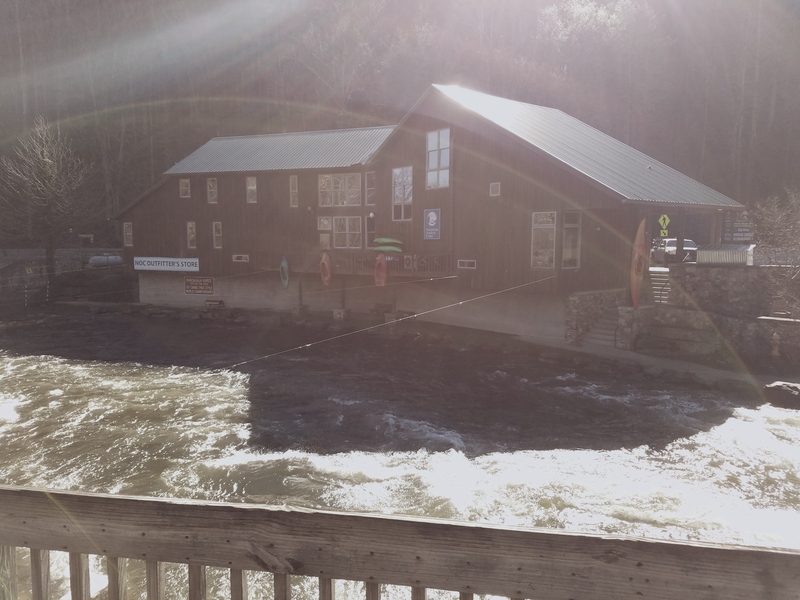 The highlight of my Hot Springs adventure was staying at Sunnybank Hostel. Elmer, the old man who runs the hostel, is a vegetarian chef. We had dinner with him and other guests and it was the best meal I had on the trail. It took us 28 hiking days plus five zeros for a total of 33 days to get to Hot Springs. It was a great feeling to get there. Someone at TOG had told me that Hot Springs was where 50 percent of hikers got off. 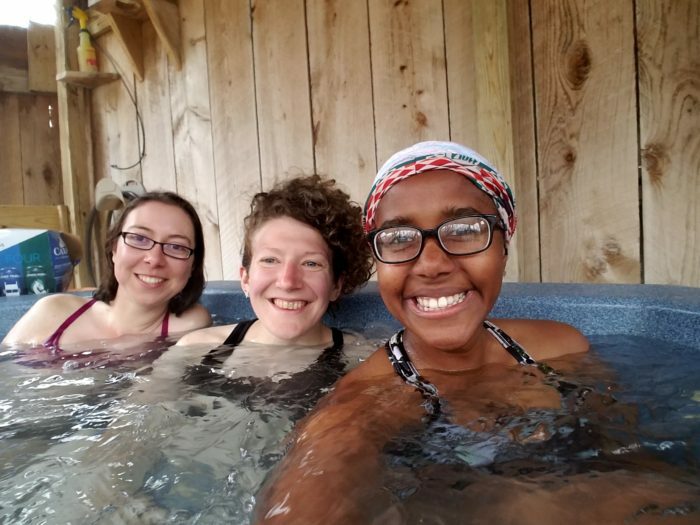 They said that if you’re still on after Hot Springs that you’re only getting off due to illness, injury, or some sort of family emergency. I don’t know how true that is but I definitely feel more capable of completely this journey then I did on day one. What a great report! Keep on a trucking, but more important HAVE FUN! !